Gold surged to a ten-month high of $1346.61 to continue the new year's incredible rally. The greenback weakened after Cleveland Fed President Loretta Mester, generally considered a policy hawk, shifted her outlook for balance sheet alteration and rate-hike to a bit softer pace, as Reuters reported. Adding to the Dollar's weakness, investors remain cautious about the trade war before China’s Vice Premier Liu He arrives in the US today to negotiate the deal further. On the other hand, the on-going uncertainties surrounding Brexit and eco-political challenges at the EU also contributed towards the Gold’s recent surge. Gold prices gained more 1.5% between yesterday's and today's session after surging to 10-month high at $1346.61 per once. 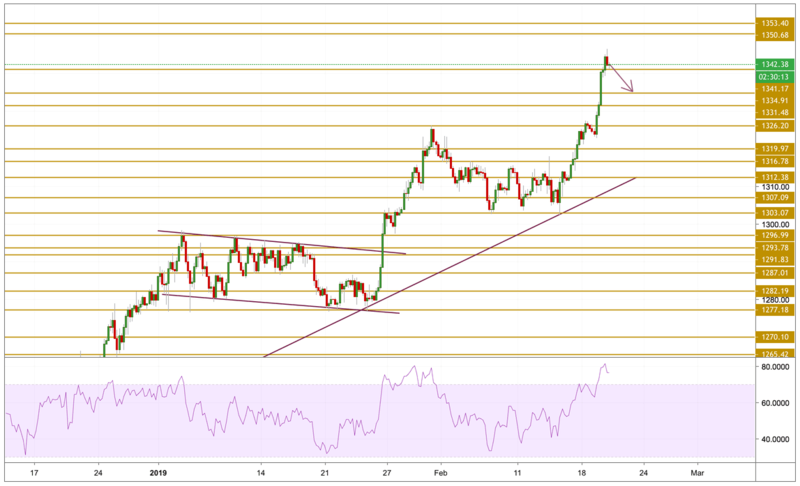 The price is currently holding above the $1341.17 support level but overbought conditions emerged on all time frames, making a correction more probable to happen. We will be focusing on the $1335 support level.